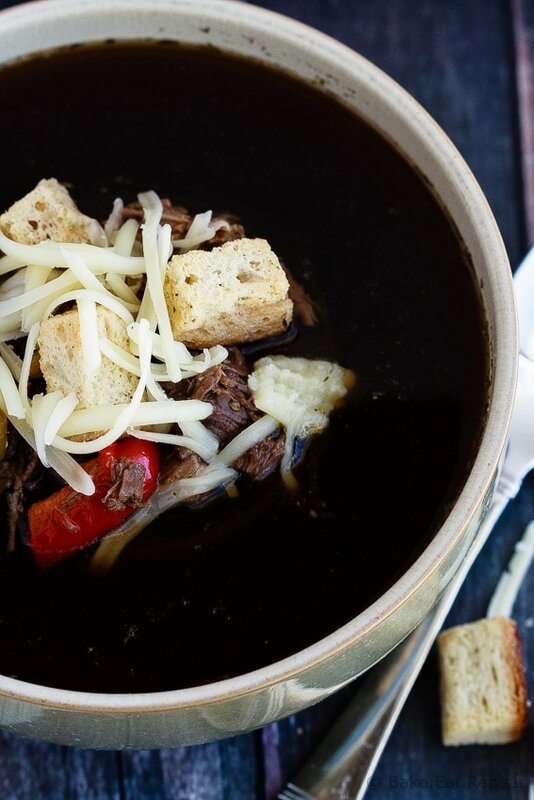 Easy Philly cheesesteak soup – shredded beef, caramelized onions and peppers, garnished with croutons and cheese – the sandwich you love in soup form! Have you made these Slow Cooker French Dip Sandwiches yet? Well, you need to. Because they’re fantastic. 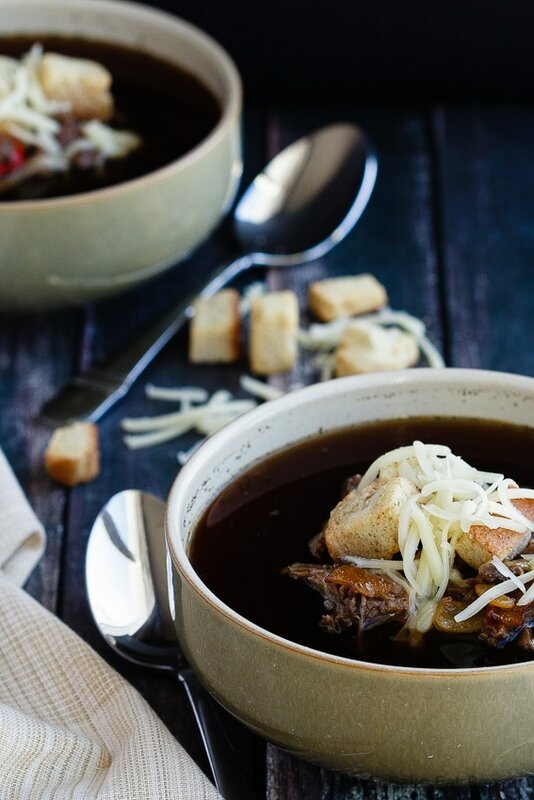 But also because this Philly Cheesesteak Soup recipe uses the same slow cooker beef, and it’s also amazing. Since you’re cooking a 3 pound beef roast in the slow cooker, it’s too much meat for just one meal. At least for my family of 5. If you’re serving 10 people I guess it’d be about perfect. But I’m not, so we had 2 or 3 meals out of the one roast. We made the French dip sandwiches the first night, and had this soup using the leftover meat the next night. I wasn’t too sure what we would think of a Philly cheesesteak soup. Now don’t get me wrong, we love the sandwiches. Philly cheesesteaks are amazing. But soup? I wasn’t too sure how it would translate. I didn’t need to worry, it was amazing. My kids don’t even really like soup all that much unless it’s tomato soup from a can with lots of fish crackers. Kind of makes me cringe a little even typing that. Not that that’s bad, but there are so many soups that are better. Like this creamy crockpot chicken corn chowder for instance. Or this Philly cheesesteak soup. So much better. So when both boys asked for seconds after slurping up every last drop of their first bowl, I was flabbergasted. Who are you and what have you done with my children may have been my first thought. The second was how often can I make this soup before they are sick of it? Because clearly I need to take advantage of the fact that they are eating something so happily that my husband and I are also inhaling! Pretty sure we’ll be making this a lot. It’s easy. It’s so tasty. Everyone loved it. And the leftovers are incredible in a number of different ways – more soup, French dip sandwiches, Philly cheesesteak sandwiches, more soup and more soup. Obviously. 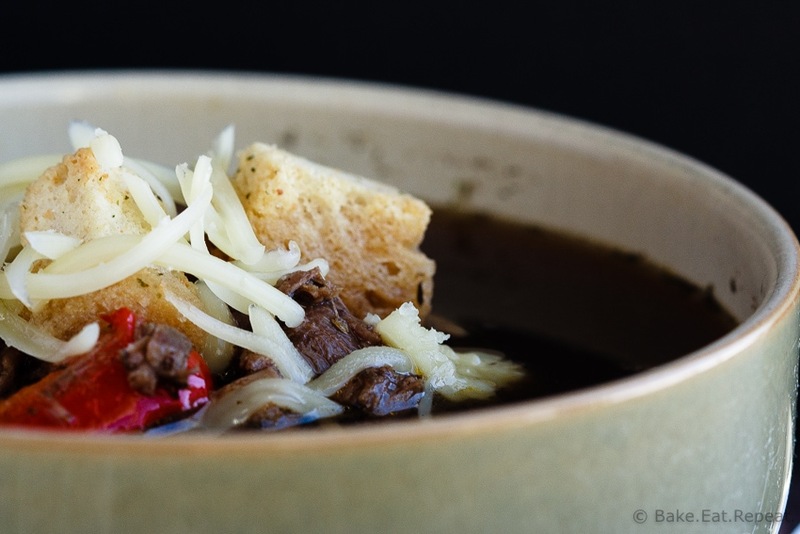 I’ve also shared this Philly Cheesesteak Soup recipe over on Food Fanatic. I love philly cheesesteaks, but I've never tried it in a soup before! This is such a fun and creative idea, Stacey! Such a great way to change up leftovers too. I used to loooove tomato soup from the can when I was little, too! Luckily I can say my palate has at least somewhat evolved since then :) This looks awesome! I am so intrigued by this soup, Stacey! I love philly cheesesteaks, but have never thought to make it into a soup before. And since I eat soup practically every week, this sounds SO good! Love the rich broth and flavors in here!